Elephants at a sanctuary in Myanmar have been donning giant blankets in an effort to keep warm amid an unusual bout of cold weather. 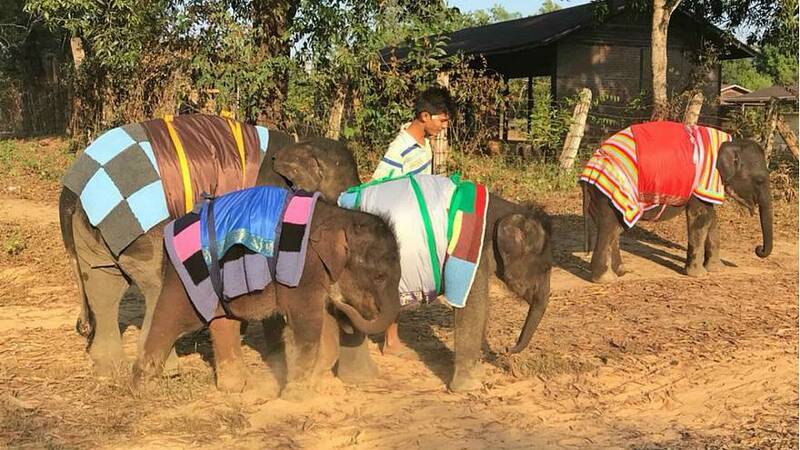 A cold front from China has brought temperatures to around eight degrees Celsius at the Winga Baw sanctuary in Myanmar’s Bago region, compared to normal lows of 10 degrees at this time of year, according to Lek Chailert, founder of the Thailand-based Save Elephant Foundation. “Many of our elephants get sick very easily… We don’t want them to get sick from the weather,” she told Euronews. Chailert, who runs dozens of camps in Southeast Asia for elephants who were abused in the tourism and entertainment industries, said staff at Winga Baw had been making straw beds and lighting fires at night in a bid to keep the animals warm. But after sharing images of the cold elephants on social media, they were offered another solution. Blankets for Baby Rhinos, a wildlife conservation craft group with some 1,500 members based around the world including Europe, South Africa and the US, offered to send over giant blankets for the elephants to wear during the cold spell. While some of the elephants initially struggled with the new attire, many are now happily playing and eating in the snug blankets. In a Facebook post on Friday, Save Elephants Foundation thanked Blankets for Baby Rhinos for the “beautiful knitting blankets”. Chailert said that “old grandmother” elephants, who are particularly vulnerable to colder temperatures, have benefited the most from the donation.